On politics, media and UFOs: "Please tactfully say 'NO' to CBC"
CBC Winnipeg want to do programme on UFO sightings. This asked for background of any RCAF input or procedures that are followed. Advise current policy. 1. Request your comments, please. 2. I suggest the policy would be to stay clear of this type of program except to answer this query with information contained in attached “form letter” that has been used by FFR (now DIS) for some time. 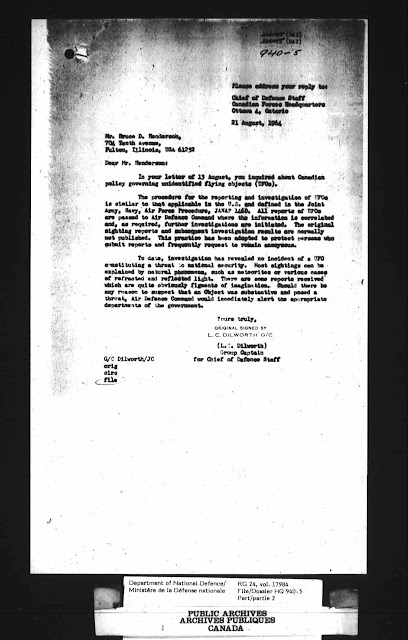 Unfortunately, there was no “form letter” in the file, so we are left to wonder what it might have been. 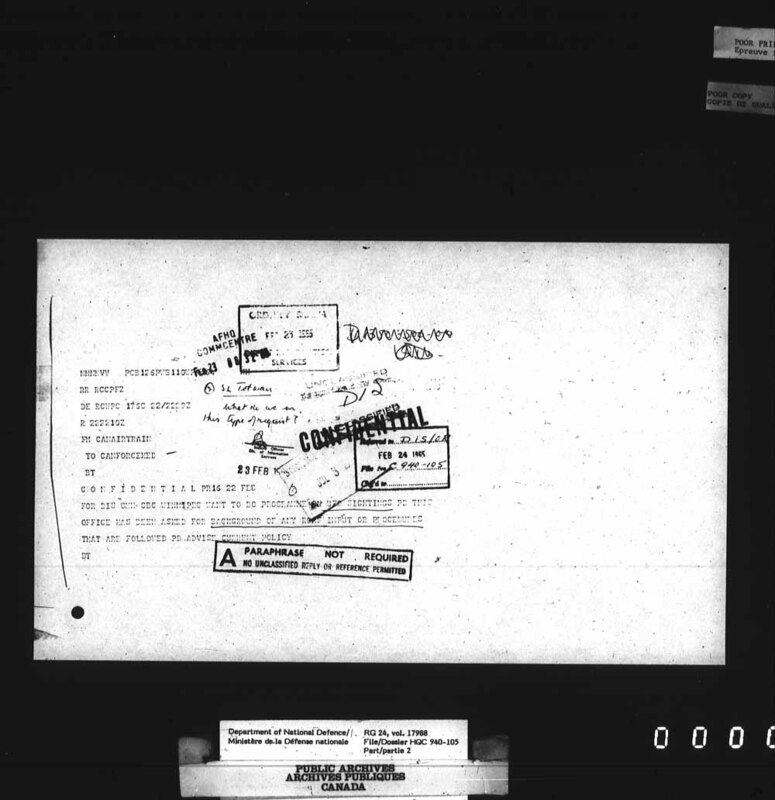 Fortunately, there are some examples in the collection of documents of letters sent to individuals requesting information about UFOs. It’s likely that some variant of these was considered. where the (3) referred to the first part of the Minute Sheet. 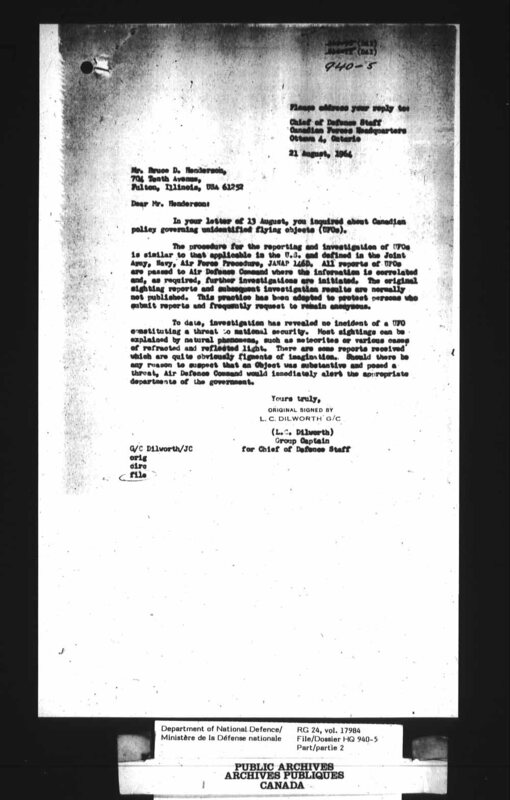 The following week, there was correspondence between Ottawa and the DND Office of Information in Winnipeg. On March 4, 1965, Colonel L.A. Bourgeois, Director of Information Services, gave his recommendations on the CBC request. 3. Please tactfully say “NO” to CBC. One can wonder if this request and tactful response affected the way in which Canadian media handled the subject of UFOs in following years. If they were told that UFOs were nothing of interest by a high-ranking government official, that could have curbed their interest. Indeed, for decades later, the CBC was less that responsive and interested in doing UFO stories. What would they have done if the Minister of Defence had said that UFOs were real? 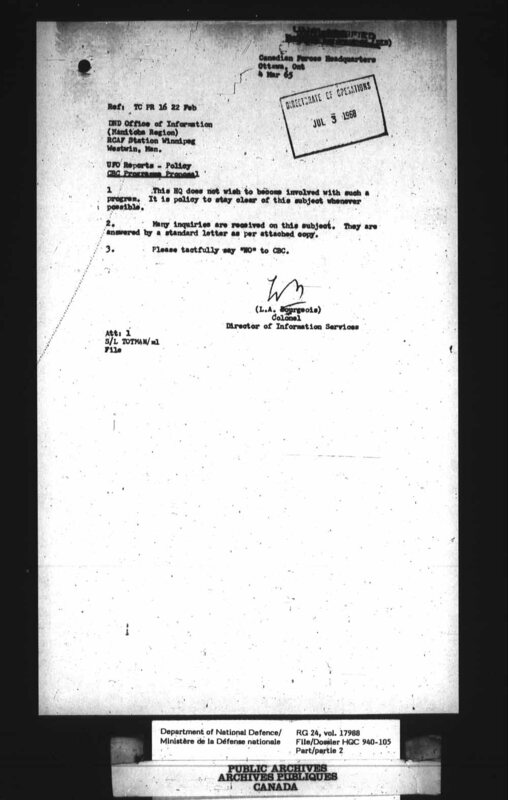 Anyway, it looks like the Canadian military was not going to dally in the subject of UFOs, especially with the media. At least, for a month or so. This wasn’t a form letter. It was a very specific discussion about the UFOs prepared for the highest executive in the Air Force and Canadian Forces. If this wasn’t written for the CBC, which presumably would have been a good public relations move, then why was it prepared at all? It’s also not a briefing statement for the Minister. It was prepared for him to present in some context. Also, there’s no indication that this statement was classified in any way, although it had never been discussed in public. Arnell’s 1965 report on UFOs reiterated the American stance that “the evidence presented on Unidentified Flying Objects shows no indication that the phenomena constitute a direct physical threat to national security.” He also revealed the existence of a Canadian committee to study UFOs “some fifteen years ago” (i.e. 1950) which “ceased to function about ten years ago” (i.e. 1955). This could have been Project Magnet, run by Wilbert Smith, which was formally shut down in 1954 but Smith continued to operate unsanctioned until his death in 1962. It could also have referred to Project Second Story, which ran concurrently with Project Magnet but was involved in the collection of flying saucer reports whereas Magnet looked at teh physics of flying saucers. Since that time, such reports as were referred to the Department of National Defence have been studied by interested staffs, and, where warranted, investigations have been made. However, in the end, Arnell notes that most UFO sightings are explained as meteors, aircraft, balloons and meteorological effects. It's been noted here and elsewhere by historians and researchers that the "very small percentage" claimed as the American results was actually of the order of about 20 per cent, so the statement is misleading if not simply incorrect. It has also been shown that there were many sightings with excellent descriptions and testimony by reliable witnesses. At least four species of alien have been visiting Earth for thousands of years... some of the aliens hail from the "Zeta Reticuli, the Pleiades, Orion, Andromeda, and Altair star systems" and "may have different agendas"... and "there are live ETs on Earth at this present time, and at least two of them are working with the United States government." UFO's are as real as the airplanes flying overhead. 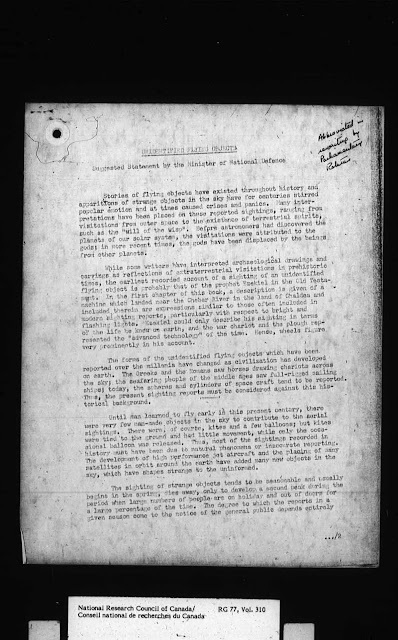 Although as Minister of National Defence I had sighting reports of UFOs, I was too busy to be concerned about them because I was trying to unify the Army, Navy and Air Force into a single Canadian Defence Force. So, when he was in a position to do something about the reports, he didn't see them as particularly worth bothering with. But today, they are the most important issue on the planet, since Hellyer now believes working with the aliens to save the Earth is essential to the survival of humanity. His testimony at the Hearings ranged from simple cover-up to Bilderberg Conspiracy. 3. Swan River Magnetic Hill; where your car "mysteriously rolls uphill"
7. Bannock Point Petroforms; turtles, bison and snakes, oh my! 10. Manipogo Beach Provincial Park; what just broke the surface of the water? still want to swim? When people ask me about a UFO report that I’ve posted somewhere, they sometimes comment about how unusual it must be to get “reliable” sighting reports. The reality is that that getting good UFO reports isn’t really that rare at all. Since there were about 2,000 UFO sightings reported in Canada last year alone, that means there are about five or six reported each day! The odds of receiving interesting cases are actually getting better. For example, in only a matter of a few days, here is a smattering of UFO sightings reported in Canada, from literally one corner of Canada to the other. A single light was seen moving up and down along the MacKenzie River in the SW sky, hovering then it disappeared. It had been flashing red, blue, white and green. The sun had set, well as set as the sun gets in July, more like a strong dusk than dark. The object was observed for several minutes following the river. Venus was behind the witness and Saturn was to his southwest - far enough away from the river to not be in his frame of reference. Witness has been on the land for many years and familiar with the planets and their alignment in the night sky. Me and my husband had a sighting last night, direction would have been over the ocean. At first what appeared to be a shooting star, then a bright orange/yellowish light was moving in one direction, changed directions and its brightness then disappeared. My husband is ex airforce, and it was no civilian plane. It lasted about 10 minutes. Two credible witnesses saw a series of reddish orange balls coming across the sky from the southwest, in a straight line. We’re on a common flight path for transatlantic flights here, but the men, retired engineers, could also see airplanes in the sky that had no connection to these objects. The sighting lasted about 15 minutes. No noise or other lights as you might see on aircraft; nothing but the balls of light themselves, about a dozen in number. Me and a co-worker were facing NW, and we both saw a light off in the distance with a distinct pattern of changing colours. First it glowed red, then green, then it shifted into 3 or 4 white lights that became brighter. The object then flew vertically up into the air, descended back down, moved left, then right, then disappeared, the whole time shifting between the same color patterns. From our perspective the light began close to the ground - about as high as the grain elevator in the distance, but then ascended about 4 times the elevators height into the air (keep in mind, it may have been very far away - in which the object traversed several kilometeres in seconds, directly vertical), then descended back to the grain elevators height, moved left, moved right, then disappeared. The light pattern: If you could imagine the light phasing in and out like this: (black) ........r-r-R-R-RED-R-R-r-r.......g-g-G-G-GREEN-G-G-g-g......w-W-WHITE-WHITE HOT-....(black) The Red and Green phased in from complete darkness almost like a wave...but when the 3-4 White lights appeared...they phased in from black, but got very bright, very quickly.